The genus Lobophytum is home to many commonly encountered species of soft coral and is part of the larger rough assemblage of corals that aquarists like to refer to as leather corals. Identifying specimens of Lobophytum to species level is not at all easy but distinguishing the genus from other superficially similar genera is actually quite easy. The ability to identify this species from others in a dealer’s aquarium is not an example of pedantry, instead it could mean the difference between positioning this coral in an altogether unsuitable location and getting its demands right in the first place. If we take a look at toadstool leather corals of the genus Sarcophyton we should notice that the animals could be divided into separate and distinct parts. There is the central column that anchors the coral to the substrate, there is the “crown” which resembles the cap of a mushroom or toadstool, and the polyps that arise from the crown itself and stretch into the water column. The latter are more correctly termed autozooids in this genus and most species of soft coral have quite prominent ones. Many soft corals from the Family Alcyoniidae, of which Sarcophyton and Lobophyton are but two species, possess another distinct type of polyp. Close examination of the surface of the coral reveals a grainy texture. This is not some unique characteristic of the coenochyme but actually a specialised type of polyp called a siphonozooid that is very small and does not usually possess tentacles. The siphonozooids are much more abundant than the larger autozooids; the large white polyps. The role of the siphonozooids is to facilitate the movement of water into and out of the colony itself. They can also contain photosynthetic symbionts. Easy as that? Of course not! For reasons unknown many specimens of cathedral coral such as the species illustrated here seem extremely reluctant to extend the larger white autozooids. Sometimes it is almost impossible to detect the presence of these polyps but otherwise and almost more frustrating is that they are present as small circular bumps on the surface of the corals. It is not uncommon for a specimen to have such an abundance of white autozooid polyps on display in a dealer’s aquarium that the first visiting aquarist to witness such stunning beauty is compelled to make a purchase only for these large polyps to never be seen again. This understandably results in an aggrieved aquarist who might become apoplectic when upon returning the coral to the dealers system the beautiful white polyps reappear within twenty minutes or so! It is difficult to ascertain why this apparent reluctance of the coral to extend its autozooids occurs-it certainly does not seem to be as a result of any nipping by resident fish. Fossa and Nilsen suggest that this may be due to the presence of hard corals in the aquarium but we suggest that this is only part of the story. The presence of the two forms of polyp in cathedral corals is the easiest way to separate this so called dimorphic leather coral from soft corals classified within different families but there are other clues as to its true identity that can help separate the cathedral from other closely related species. It is never found with a long “stalk” like Sarcophyton spp. soft corals and is often encrusting, sometimes forming huge colonies. Alternative common names for this species include the devil’s finger or finger leather coral. Selection of a good specimen is of the utmost importance for the cathedral coral. Individual colonies with bright yellow or white patches anywhere on the body should be avoided. It is not uncommon to find the folded margins of this coral gradually dissolving as it succumbs to bacterial infections. If you can located a specimen in which the large autozooids are extended then that’s great but if not then don’t worry too much as the coral may be located in an aquarium that does not suit such polyp expansion. 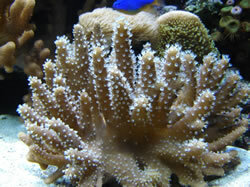 Once transferred to your aquarium and if conditions are conducive then autozooid polyp expansion will certainly occur. You should be aware that autozooid polyp colouration can vary from brilliant white to brown-beige via yellow and so witnessing the autozooids expanded does have definite advantages for the aesthetes amongst you. Despite the obvious affinities of the leather corals it should be noted that not all species are easy to maintain. Lobophytum cathedral corals though not necessarily difficult can be quite particular about where they like to be placed and so the aquarist should offer strong lighting and strong flow for the best results. The specimen illustrated here was located on the bottom of a 60cm deep aquarium that had twin 150W 13000K metal halides over the top. An aquarium using T5 lighting might need to have this coral species in a very prominent high position. In short, it is difficult to give this species too much light and very easy to give it too little. With regard to flow this species shares the requirement of all leather corals for a minimum flow rate that is capable of lifting the mucus film that can form on them as a result of their excretion. Should flow be low enough for detritus to settle upon the surface of the coral then the latter may show an adverse reaction. It is difficult to provide too much flow for cathedral corals. Care should be taken with the location of this species particularly if it is “upstream” of stony corals. Many soft corals are known to use highly toxic terpenoids as anti-predator and anti-colonisation defences and the fact that the coral can constantly produce these can mean that if the stony coral is not killed by this chemical onslaught then its growth at least could be seriously compromised. Although the captive propagation of Lobophytum soft corals is nowhere near impossible it does carry more risks to the parent colony that for other leather corals like Sinularia or Sarcophyton. As we hinted at earlier when describing the selection of good specimens this species seems to be susceptible to bacterial infections particularly when damaged or when placed in unsuitable conditions. Any signs of yellow or white necrotic tissue should be addressed immediately. Often relocating the cuttings into areas of high flow or subjecting the parent colony to more than usual flow can help but the propagator should consider iodine dips if the condition does not clear up. We are sure that there are many points that we have neglected to mention about this attractive species of soft coral and yet we hope that if you weren’t aware of it already then you are armed with sufficient knowledge to feel confident to have a go at keeping a specimen. We would like to thank Robert Sutton for the use of his image of Lobophytum sp. Fossa and Nilsen. The Modern Coral Reef Aquarium Dahne Verlag. Baench. Marine Atlas Volume 2. Sprung: Corals. A Quick reference Guide. Ecology: Vol. 58, No. 6, pp. 1218–1236. Kingsley-Smith, P. R., Richardson, C.A. & Seed, R. 2003. Stereotypic and size-selective predation in Polinices pulchellus (Gastropoda: Naticidae) Risso 1826. Journal of Experimental Marine Biology and Ecology, 295, 173-190. Kingsley-Smith, P. R., Richardson, C. A. & Seed, R. (2005). Growth and development of the veliger larvae and juveniles of Polinices pulchellus (Gastropoda: Naticidae). Journal of the Marine Biological Association of the UK. Vol. 85, pp. 171-174. Kingsley-Smith, P. R., Richardson, C. A. and Seed, R. (2003). Seasonal and size-related egg collar production by Polinices pulchellus (Gastropoda: Naticidae) Risso 1826. Journal of Experimental Marine Biology and Ecology. Vol. 295, pp. 191-206. Kingsley-Smith, P. (2003). Polinices pulchellus: The James Dean of gastropods: Living fast, dying young. Journal of Shellfish Research. Vol. 22, p. 337.